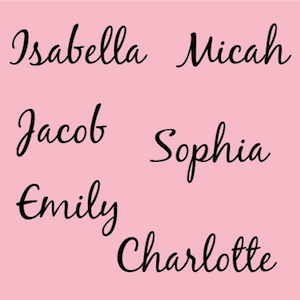 The Zebra Background/Name can turn your plain room into something extraordinary in minutes! Have a blast brightening up your office. Create some memories with your kids while cheering up their room! 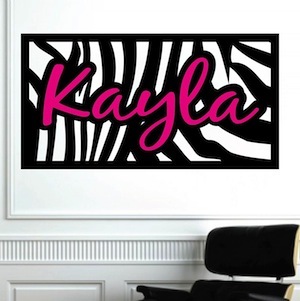 The Zebra Background/Name Wall Decal is an easy to install without the hassle of cleaning a brush, roller, or drop cloth when you’re done! Just a touch of fun is all you need to include! Apply your Zebra decal first. Apply your Text on top of it and voila! This decal was easy to work with. The decal and the name are seperate, but still easy to work with. Such a sweet wall decal. 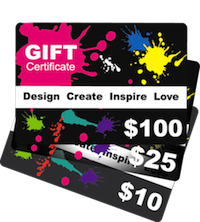 I got a gift certificate and I'm glad I bought this design. I just put this up a few days ago and it looks great. I love it! highly recommended. This has to be the cutest name design i have ever seen. It suits me so well. I am a BIG fan of animal print and i love this. this looks just like the picture shown. first you apply the background then you place the name on top of it. easy to install. i got it in the largest size and in the same colors shown (black and hot pink). the font is really pretty. it goes really well with my zebra print pillows and hot pink curtain.